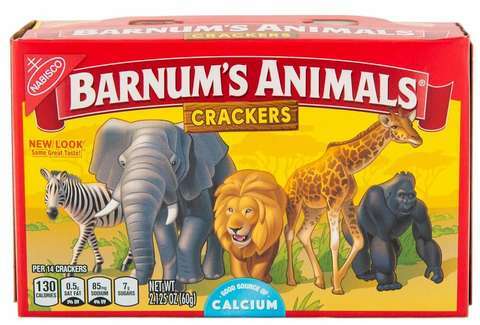 Much like the kids whose lunch boxes they've occupied for generations, Barnum's Animals Crackers are finally growing up and being sent out into the world to roam free. Or that's at least one way to look at the new redesigned packaging for the beloved snack food, which now features the beasts on the boxes free from the cages they've long been held captive inside. Fortunately, though, neither the cracker recipe, nor the shapes inside, are changing at all. Following a push from People for the Ethical Treatment of Animals (PETA), Mondelez -- the parent company of Nabisco, which makes the crackers -- agreed to redesign the iconic box packaging to show the animals free from the boxcar cages they were depicted as being held inside of for the last 116 years. In a letter to Mondelez that it first sent in 2016, PETA argued that the boxes featuring caged animals were outdated in light of the growing opposition to the exploitation of animals in circuses. "Given the egregious cruelty inherent in circuses that use animals and the public’s swelling opposition to the exploitation of animals used for entertainment, we urge Nabisco to update its packaging in order to show animals who are free to roam in their natural habitats," PETA wrote in its letter, according to the AP. The newly designed packaging, which can be found on store shelves starting this week, shows the familiar red and green boxes but with a zebra, elephant, lion, giraffe, and gorilla wandering freely. It's vaguely similar to the proposed redesign PETA mocked up for Mondelez in its letter. In the time since PETA originally submitted its letter, the crackers' namesake Barnum Ringling Brothers and Barnum and Bailey Circus, has gone out of business due in large part to dwindling ticket sales, so the change-up seems apt. “When PETA reached out about Barnum’s, we saw this as another great opportunity to continue to keep this brand modern and contemporary,” said Jason Levine, Mondelez’s chief marketing officer for North America, in a statement, per the AP. Still no word yet from the zebras, elephants, lions, giraffes, and gorillas of the world on the changes, though.